Name: Is Key name by which route will be identify, it should be unique name. URL : It defined the kind of the URL you are connecting with. It will be the same of controller; e.g if you will see that customer is controller name where the action is DisplayCustomer; it will be like; http://localhost/ customer/DisplayCustomer. If there is any value that you like to fetch suppose the Customer id is 110 than you need to pass as http://localhost/ customer/DisplayCustomer/110. You can provide the validation also to the routing that what number you are sending for action. Default : It assign the default routing for your application. If you want to define the parameter as optional you can use the UrlParameter.Optional. 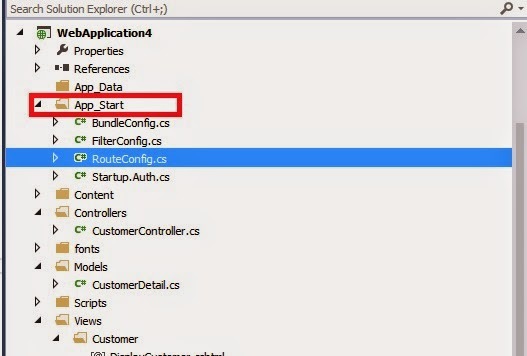 You can also set the default routing by below code on the existing routing. Using of the Outbound we can redirect from one page to another directly that basically we are doing in the web pages. Generally we are using anchor tag to move from one page to another like <a href=”home.aspx”>Home</a>. 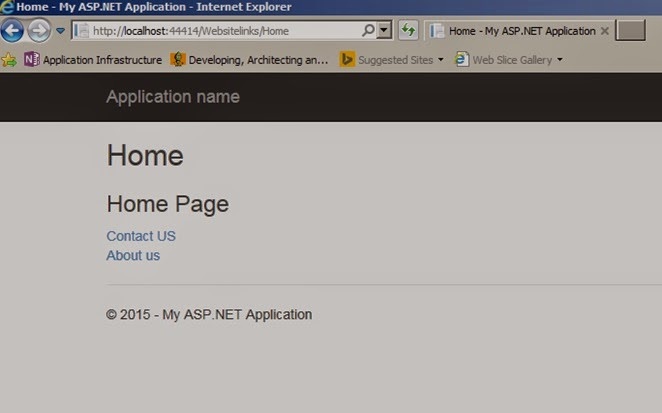 But as per MVC it is not the proper way you have to go through the controller only for any unbound URL. It will look as like and if you will click on contact page it will redirect to contact view.